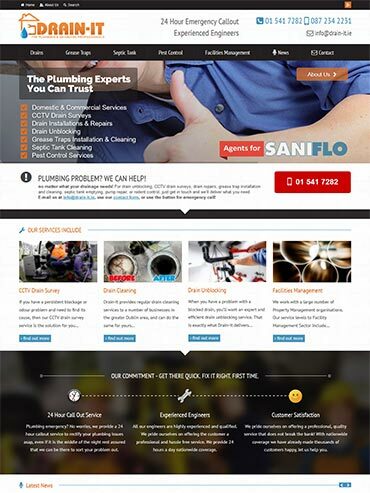 Saniflo Sales (Ireland) is the Irish arm of the company that also operates Saniflo Sytems UK, for which we had already developed a stylish, informative, and fully responsive e-commerce site. Based in Dublin the company offers the innovative range of Saniflo macerator pumps, grey water pumps, and condensate pumps, which allow installation of plumbing solutions in places that would otherwise be impossible due to lack of access to suitable outflow pipes. Examples include installing a new toilet under a stairs, converting a walk-in wardrobe to an en-suite bathroom, and placing a washing machine or dishwasher in a new location. They are also agents for the new range of Kinedo shower cubicles and walk-in baths – delivering sleek elegance and style to any bathroom design. With their new UK site already built, they asked us to replicate it for Ireland. It was to be broadly the same as the UK site, with just some necessary changes such as the contact details for Ireland and prices in euro rather than Sterling. The hard work was already done on this one, as while we were building the UK site, we had already done all the market research and competitor analysis in order to decide on the best style and strategy for our client. We agreed with Saniflo Sales that the same strategy should be applied to Ireland. This was to deliver a website that would stand apart from competitor sites, which are generally unengaging and little more than ‘brochure’ product listings. The ultimate aim of the strategy was to portray levels of professionalism and expertise that would inspire people to buy from our site rather than a competitor’s, if product pricing was broadly the same. All content had already been created for the UK site, with just some minor changes being necessary for Ireland. Similarly, the design of the Irish site is the same as its UK counterpart. It is an attractive and user-friendly design, with a seamless browsing pathway between the different products to allow the user find the correct choice for them. The design also includes strategic use of colour imagery and ‘lifestyle’ shots of product applications, in contrast to the less appealing images shown on competitor sites. And also as with the UK site, we performed large amounts of both on-page and off-page SEO measures, and advanced e-commerce functionality, including full stock control system integration, SSL certification for secure online shopping, and Stripe payment gateway integration. Insure My Holiday is the new travel insurance wing of the City Financial Marketing Group. Based in Dublin, CFM are one of Ireland’s largest and most respected brokers in the fields of personal, commercial, and motor insurance. All those sites had a uniform look, but they elected to seek a new design and new approach when it came to build their new travel insurance site. They knew of our well-earned reputation for innovation and style – and so they came to us. We were delighted with the opportunity. As this was a new venture for the client, a series of detailed discussions first took place, as our market research investigated the size of the travel insurance market online and our content team gathered all required information. We established key selling points such as there being no extra cost for children’s travel insurance when booked with an adult, and we created concise yet compelling content to portray the benefits of choosing Insure My Holiday. We also liaised with our partners in CGL Retail Solutions for logo design, and MDC for the quote engine that would be the backbone of the site. Once all these elements were in place, we moved on to building the site itself. 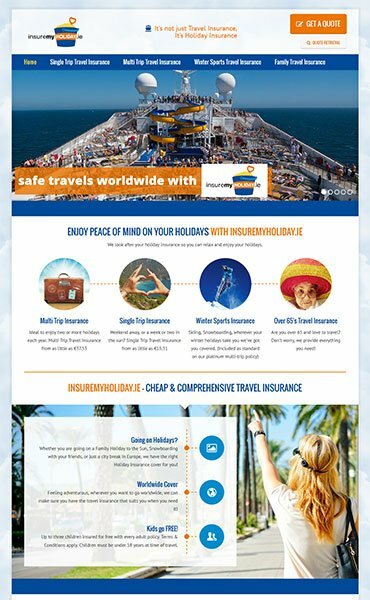 With travel insurance being such a competitive field, it was important that this site would stand out from the rest. A review of opposition site showed that most were quite dull and text-heavy, and therefore we designed a fresh and clean site instead, with attractive graphics, catchy slogans, and clear calls to action. We diligently followed SEO best practice for all pages as we aimed to rank highly for key terms like ‘family travel insurance’, ‘multi-trip travel insurance’ and ‘single trip travel insurance’, and each page was also given a number of clear ‘get a quote’ buttons in order to direct the user as easily as possible to the quote engine so they could see the great value that insurance from Insure My Holiday represents. Our clients were delighted with the result and have engaged us to conduct a full follow-up digital marketing campaign, including content marketing, PPC marketing and social media marketing. Visit Insure My Holiday to see the results of our work. Drain-It are leading specialists in drain unblocking and drain repair services, for the domestic, commercial and industrial sectors. Based in Dublin, they also provide a range of other services, such as grease trap installation and cleaning, septic tank maintenance, and pest control. The company recently changed hands and the new owners were unhappy with two existing websites that were already in place. They ranked poorly for key search terms, and were disjointed in structure and inconsistent in tone. They engaged us to build them two new sites – one to concentrate on the Dublin market, and one for the rest of the country. We first performed extensive keyword research, to identify the size of the online market and the terms to target for ranking purposes. We carried out an intensive audit of the existing site, and also of competing websites which ranked higher. We used all information gathered to advise our clients of realistic expectations of what the new sites could achieve, and we agreed an action plan with them. Then we got to work. Our senior copywriter had a half-day meeting with Drain-It management, to gather all information required for content purposes. He then used this information to create keyword-optimised text content that quickly provides whatever information the user may be searching for (bearing in mind that the user may often be in an emergency situation with a blocked sewage pipe or some other problem!). Two versions of all content were produced – one for the Dublin site, and one for the ‘Rest of Ireland’ site, with greater emphasis on some services for one than the other. Meanwhile, our senior web developer/designer meanwhile sourced a number of images and graphics for the sites, as well as editing several that were provided by the client. Once the text content was agreed upon, he put in all in place according to the project charter agreed. 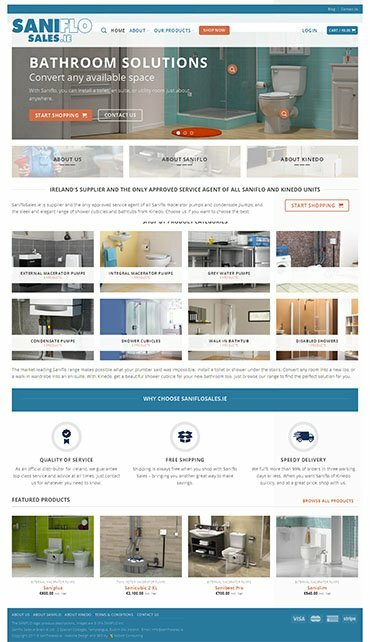 As standard with all our designs, the new sites are fully responsive for use on mobile devices, and have comprehensive SEO measures included, both on-page and off-page. We then ran a Google AdWords campaign for our client, to coincide with the launch of the two new sites. Just visit Drain-It website to see results of our work.